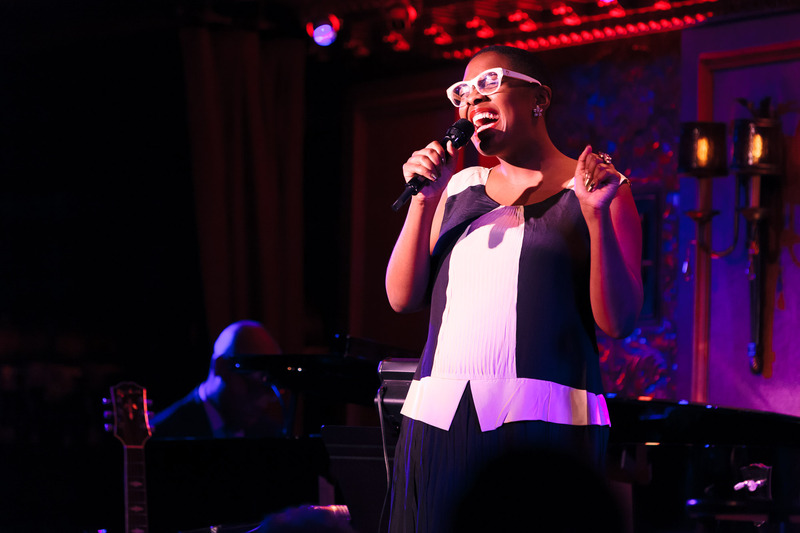 When I arrived at 54 Below in midtown Manhattan on Tuesday night for the New York City release of Cécile McLorin Salvant’s WomanChild (Mack Avenue Records) , I had already resolved not to take notes. I was just going to listen and enjoy the show. After spending the last three months listening to the album, researching and writing a feature essay on McLorin Salvant and her new album, I was determined to relax and enjoy the live experience—my first with her band—and certainly to not worry about any sort of writing (I even left my notebook at home). After all, in that feature I have included: those two months of work, quotes from an interview we shared, citations of others’ writing and research, and thousands of words. What else could I be missing? Cécile McLorin Salvant and Aaron Diehl. Photograph by Matthew Lomanno. I was sitting back comfortably, reassured in and elatedly aware of the pure artistic mastery McLorin Salvant and her ensemble were displaying…until the end of her first chorus of “You’re Getting to Be a Habit With Me” (a 1932 standard by Harry Warren). That’s when I reached for my absent notebook. At the end of the melody’s last phrase, where McLorin Salvant ought to have sung the words “with me,” she did nothing, having extended the preceding few words just slightly longer and farther across the barline than their notated values, but still with enough time remaining to finish the lyric before the start of the next chorus. And yet, she did nothing. Well, she waited. And so did the band. They waited. That pregnant pause—in which anything could have happened but nothing had yet—lingered into the top of the next chorus, the beginning of Aaron Diehl’s piano solo. Bassist Paul Sikivie and drummer Rodney Green delicately held the form open, allowing the moment to continue, while everyone, including the audience, continued to wait. Finally, after what seemed to me at least six or eight full measures, Diehl quietly punctuated McLorin Salvant’s phrase for her in the lower register of the piano, capping off her vocal chorus with the “with me” pitches before launching into his own improvisation. Awestruck, I called out in delight. With yet another beautiful moment, McLorin Salvant and her band had dispatched any last remnants of the imagined distance from the performance and its audience to which I might have been clinging and brought me into the fold, while I hurried to record the moment, newly inspired, and now feverishly pecking out notes on my phone. Phasing continuously between the written tune and improvisation, “Habit” concluded with a bass/vocal duet, in which McLorin Salvant stood close to Sikivie, exchanging phrases and working the standard’s lyric out. Not just faithfully rendering the lyric, nor just telling its story, but working it out. She dropped words, repeated others, elongated phrases, varied articulations and vocal timbres, bringing her considerable study, expertise, and historical knowledge to bear on the tune’s text in a confident and inventive display of sheer interpretative genius. And nothing was safe—not a single word taken for granted or dispatched in a perfunctory manner: in one iteration of the especially mundane lyric “as regularly as coffee or tea,” she breathfully exhaled the words with sensuous desire and palpable longing, while in the next she enunciated it sharply and in a pointillist fashion, as if she were typing the words out, which, coincidentally, I happened to be doing at that exact moment across the room. The overwhelming triumph of Tuesday evening’s performance came about through the unrelenting succession of magnificent moments such as these. McLorin Salvant’s declarative delivery of the lyric in the African American spiritual “John Henry” teetered magically between classical recitative and the rapid-fire strikes of the hero’s steam hammer about which she was singing, enlivening the already tightly interlocked accompaniment with yet another polyrhythmic layer. Throughout the evening, McLorin Salvant also displayed her mastery of vocal jazz history through sonic references to some of her predecessors: on “Yesterdays,” she delved into her often lauded lower vocal register, evoking the timbre of Sarah Vaughan’s voice, but then drastically altered the subsequent phrase in register, articulation, and affect—as if to remind us yet again that she always approaches and performs art on her own terms. During “There’s a Lull In My Life,” the band continued to revel in hanging and pregnant silences where a single brushstroke, elongated phrase, or bent pitch could reverberate to great effect through the room and to the surprise of the eagerly and audibly engaged audience. The live performance of the album’s compositions added yet another level of counterpoint to the recorded arrangements—one between the musicians and the charged audience whom McLorin Salvant’s presence commanded from the concert’s incipient phrases. At no time was this more palpable than during her rendering of the Valaida Snow hit, “You Bring Out the Savage in Me.” The audience gasped and chortled throughout McLorin Salvant’s ironic and highly theatrical performance, which she ended with growling and rumbling repetitions of the word “savage,” while Diehl lingered just below the surface with some deftly executed and highly intricate harmonic sequences, juxtaposing even more tinges of musical and emotional irony onto the arrangement. The sympathetic creativity shared by McLorin Salvant and Diehl, easily perceptible on WomanChild, was even more pronounced live. Diehl’s piano performance reaches new heights with McLorin Salvant: her inventive deconstruction of lyrics through timbral and rhythmic play inspires an audible sense of experimentation and adventure in his playing, while his acute and reactive sensitivity to her every vocal gesture simultaneously amplifies their efficacy and creates a collective dynamic of virtuosic interplay. Added to this on Tuesday evening was the particularly electric performance of drummer Rodney Green, who was nothing short of exemplary. Simultaneously responsive and insistent, Green propelled the entire show from the drummer’s throne, staging a clinic in dynamic accompaniment. Bassist Paul Sikivie, not featured on the recording, performed splendidly throughout but especially during his duets with McLorin Salvant, which proved to be some of the most tender and engaging of the whole set. The guitar and banjo virtuoso James Chirillo also contributed empathetic and reverent accompaniment on a pair of songs, having been introduced with high praise by McLorin Salvant and earning due appreciation from the audience. And finally, the entire performance and all in attendance benefited from the concert’s setting: 54 Below is the rare venue that combines complimentary acoustics and a welcoming atmosphere with meticulous attention to the technical staging of a performance—an ideal locale for McLorin Salvant’s theatrically inclined, emotionally captivating, and interactive performances. 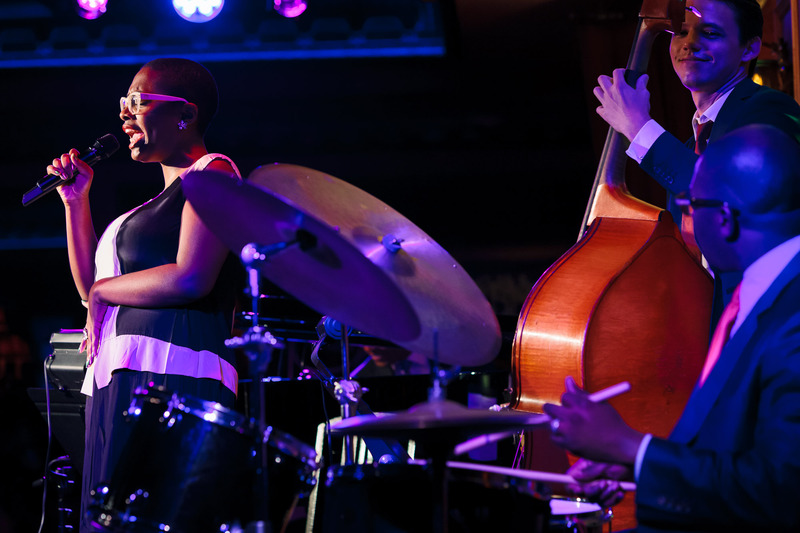 Cécile McLorin Salvant, Paul Sikivie, and Rodney Green. Photograph by Matthew Lomanno. The album WomanChild has already begun accruing due praise and will continue to do so. One of the album’s supreme successes lies in its masterful production, which manages to capture some semblance of the inspired and emergent beauty of McLorin Salvant’s live performances. Ultimately, though, any album is just one moment in an artist’s career. Our ability to revisit that one moment through repeated listenings amplifies the importance of recordings, assigning them great(er) value. A recording also allows for the patient composition and editing necessary for writing and critique; and it may even suggest to us an imagined sense of liveness. But all of that can never make the album more than it is—just one moment. On Tuesday night, after I considered myself very well versed in WomanChild‘s recorded particularities, Cécile McLorin Salvant reworked the album the same way she reinvents each and every performance of a composition’s lyric, presenting me and the entire audience with new moments of still higher artistic achievement.